Select this icon in the table below to vis­it the instru­ment on the Pipe Organ Data­base. The list below includes all organs that received Cita­tions from the program’s incep­tion in 1975. The list is pre­sent­ed in descend­ing order, with the high­est num­bered awards first. 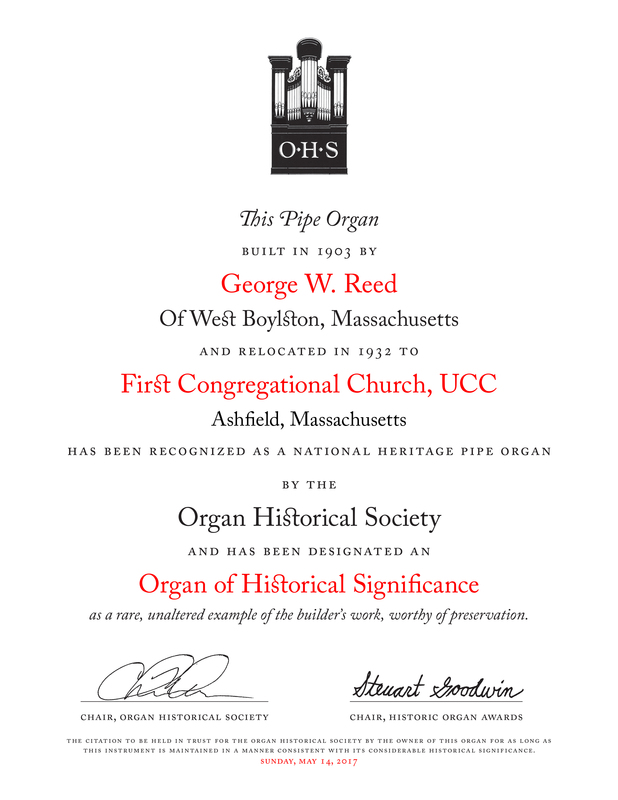 Any­one can nom­i­nate an organ for a His­toric Pipe Organ Award: mem­ber­ship in the Soci­ety is not required. We wel­come nom­i­na­tions for both the awards. Please address any ques­tions you may have to the Chair of the His­toric Organ Awards Committee, Steuart Good­win. Sam­ple of a recent­ly award­ed cita­tion. Any Date of Award field left blank is because it was not recorded. Select the Citation Icon to see more about the Citation and the instrument. Clicking on any cell in the Table Header will sort by that row. 390 Derrick, Felgemaker & Co. 1872 Holy Trinity R.C. 322 The Aeolian Co 1927 Residence: Hubert T. Parson "Shadow Lawn"